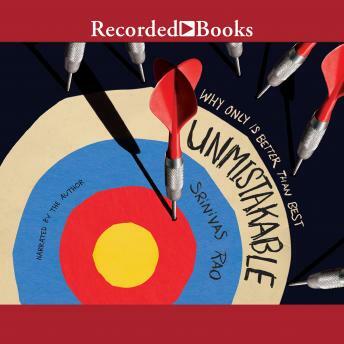 After getting rejected from many business schools and fired from several sales jobs, Srinivas Rao decided to stop doing what he thought he was supposed to do and start working in a way that felt honest. He launched the Unmistakable Creative Podcast to interview some of the greatest minds in business--including Seth Godin, Simon Sinek, Pam Slim, Elle Luna, and Ryan Holiday--finding a surprisingly big audience. This book distills the lessons, anecdotes, and insights of the 500+ people he has interviewed. Unmistakable art needs no signature. As soon as it's in front of you, you know exactly who created it, like Banksy's street art or Tim Burton's films. Whether you're a business owner, artist, or anything in between, when your work is unmistakable, your competition becomes irrelevant. They can't copy you. The key to being unmistakable is to stop trying to be the best--because that would mean you're sticking to plans and rules that have already been set for you, choosing what's safe and reliable. Rao argues that your most meaningful, impactful, and joyful work exists outside the "being the best" mindset, if you can strip away the expectations and pressure that you've internalized--to lead you to be the only.